Elizabeth Wyman | The Journal Gazette Indiana Tech hockey senior Adam Jonak will compete for his home country of the Czech Republic in the Winter Universaide in Krasnoyarsk, Russia, from March 2 to 12. Adam Jonak hasn't lived in his native Czech Republic since he was 14. 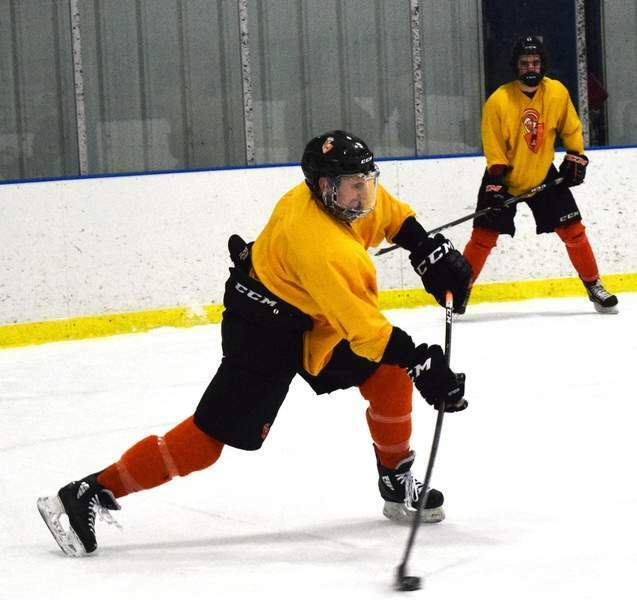 The Indiana Tech hockey senior has dedicated the better half of the last decade to perfecting his game and getting noticed. In the midst of an outbreak season, the forward has guided this Warriors team to a 14-game winning streak – the longest in program history. Along the way he's earned himself a spot on the 2019 Czech Republic Universaide team, representing the country he left to pursue his dream. The Winter Universiade held in Krasnoyarsk, Russia, this year is similar to the Winter Olympics but consists of college players from around the world competing for their respective countries. Jonak had a chance to go over and practice with the team in December but says it'll still be a challenge to compete with players he's seen little ice time with when the games are held March 2-12. Jonak, who's the only player on the Czech team currently playing in the United States, says his selection was a complete surprise to him, but his numbers this year prove he's deserving of the honor. Jonak leads the team in points (34), assists (20) and is tied for second in goals (14). He's led Warriors (19-3, 7-2 WHAC) to the top of the WHAC standings and second in the NAIHA standings. Last season he had just 23 points, five goals and 18 assists. His improved play is a testament to Tech hockey's player development, coach Frank DiCristofaro said. “We're really happy for Adam; he works really had,” DiCristofaro said. Ironically, one thing Jonak's done to up his game is not go home. “Every single year I went back home for the summer, and this year I stayed in Michigan and played in a summer league,” he said. It's showed in every facet of his game. “I think he stressed a lot last year,” DiCristofaro said. “This year he's let it flow through him a little better and I think his start was a big thing for him, too. International play poses new challenges for Jonak, who did play a season in Germany when he was 14. But the larger ice surface likely benefits the 5-foot-7 speedster. “From his perspective, he's a really good skater so being on the larger ice is going to help him,” DiCristofaro said. Indiana Tech looks for consecutive wins 15 and 16 this weekend against Lindenwood. While Jonak will miss a portion of the season competing with the Czech team, he is focused on one goal.